The main rule that should bedo lighting in the bathroom, is approaching its brightness to the brightness of the lamps in the intermediate areas. With this exit does not experience discomfort from the room. To the lighting in the bathroom, not only contributed to finding comfortable in it, but still it was nicely decorated, it is necessary to consider several options for the location of devices. If the organization of lighting in the bathroom does not take into account the rules for placement of lamps in the room did not turn out to create a favorable atmosphere for relaxation. For general lighting device includes,which often are placed on the ceiling. If you like classic interiors, is to hang a chandelier in the middle or closer to the door. In the bathroom more often set point devices. They are well combined with suspended ceilings and can uniformly illuminate the entire area of ​​the room. Important! If the bath is separated from the rest of the screen space, it must be placed on a separate fixture. By working lights are deviceswhich are installed over the sink, as it is a place you need to cover more efficiently. To light does not "hit in the eye," is to place devices above eye level so that they are symmetrical and the light towards the floor. Council! Usable are lamps which have a flexible arm, since they can turn in the right direction to guide the light. Lower lighting is at floor level, orin different compartments. It is necessary to create a relaxing environment. As lighting is generally used LED strip, which are located on the edge bathtub, as well as on the interior of the room elements. The main challenge in creating lighting facilities is to find the optimal variant in which all types of lighting are harmoniously combined. Do not choose cost models of lighting fixtures,body which is made of colored glass. This is due to the fact that such lamps can distort light, and dark to make room. That is why the model purchased with white or clear glass. Size is determined by the fixturehigh ceilings and full size bath. With a low ceiling, do not fit any one model hanging. In this case, commonly used wall spotlights and downlights. In addition, the small bathroom is not necessary to install lighting fixtures, which are the head for more than 10 cm from the ceiling surface. Also, the choice should be based on stylisticthe design of the room. If the bathroom is made in the Japanese style is to choose lighting model that when the spread light soothing colors. Metal instruments in the interior will look ridiculous. If the room is contemporary in style, chosen products, made in the form of geometric shapes. These materials should be preferred metal and plastic. The classic bathroom installed devices laconic forms. However, they should not have additional elements. 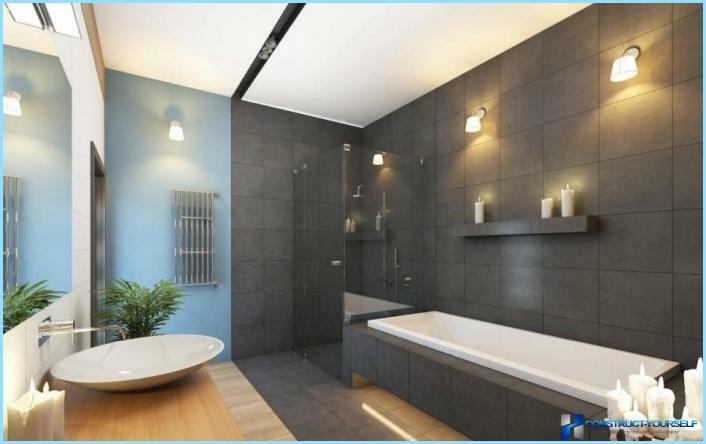 You can also see examples of lighting in the bathroom shown on the photo. 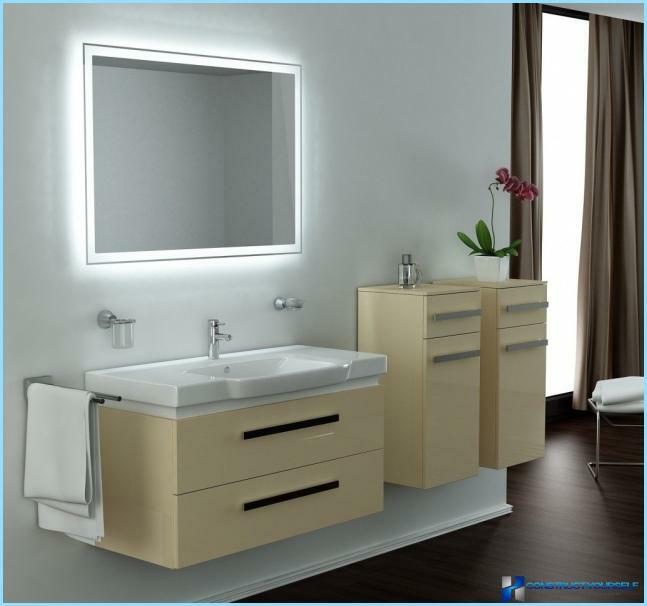 Due to the light zoning premises cancreate in the bathroom a more comfortable atmosphere. 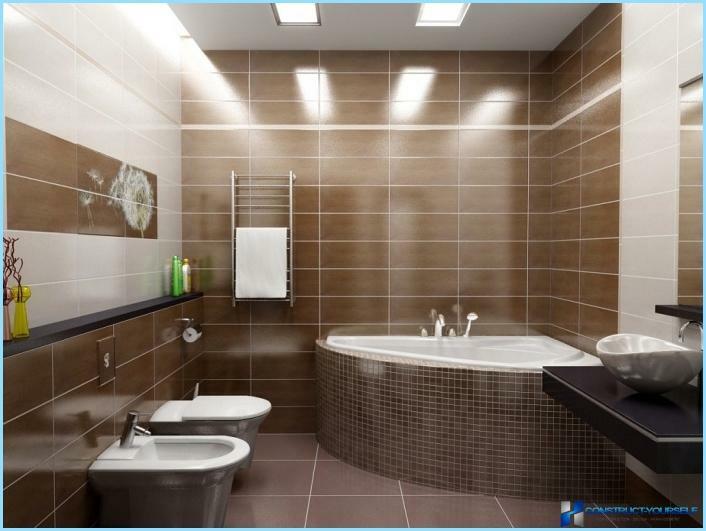 Almost all of these areas is allocated taking shower area and space near the mirror. Over the sink to install bright light devices. 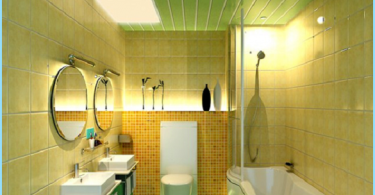 If the bathroom has interior elements, which are important to maintain the style, use mood lighting. To the maximum reflection in the mirrorwere true, you need to choose products that provide color rendition of all colors. Often near the mirror wall mounted devices, providing diffused light. The height of the fixed products must comply with the growth of man. A common mistake becomes binding on the ceiling. In this case, during the approach to the mirror on the face begin to appear extra shade. The best option is the mirror from all sidesequipped with a backlight. When selecting bulbs is to focus on color reproduction, so that it was as close to natural light. When choosing a device for a mirror is to focus more on design and style. If this is a classical interior, you should choose products that are similar to chandeliers with lampshade. For modern interiors fit a wide variety of products. The interior style. 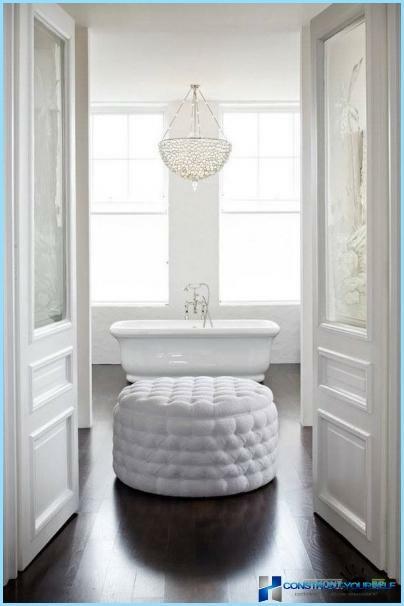 If furnish the bathroom to use light materials, products need less, as all surfaces will reflect light. The height of the instrument. The higher the ceiling, the more you need light fixtures, as they are located farther from the person, the less bright light they give. Light type. If selected spotlights, use about three devices per room area. Important! To avoid extra work, is to determine the location of fixtures at the stage of the bathroom renovation. 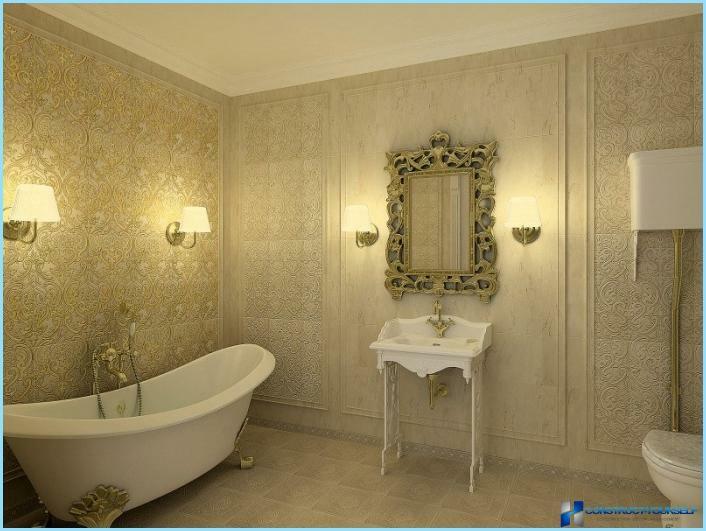 The first type 2 should be used in bathroomsthe rooms are decorated in a classic style. Usually, only one room chandelier. But if the light is not enough, it is necessary to use the wall products made in a similar style. It is worth remembering that such products, in many cases, can not be combined with spotlights. If you choose modern or Japanese style,It becomes the ideal option to use spotlights. They can be installed almost anywhere, but at the same time highlighting the main room area. Many people use this type of lighting fixtures for the bottom, if the floor of the room has a stage. LED strips are used as products foradditional lighting. They are located on the polotke about interior and furniture in the bathroom. They are usually combined with point products. Thus, to choose lighting fixtures for the bathroom, to determine the style of decoration enough. LED lighting is suitable in the bathroomfor virtually all types of premises, so the selection can be done from a variety of options. A common way of lighting company - setting instrument on the entire surface of the ceiling. To light shines evenly, enough to place LED devices at the same distance from each other. LEDs for general lighting are onceiling. If you need to allocate a certain area or object, devices are installed in accordance with the features of the room. The easiest option is to install the fixture on the ceiling at an angle. Thanks to this stream of light takes on a wall, which allows to allocate part of the surface. LED devices are often used if you need to install lighting in the bathroom with a stretch ceiling. 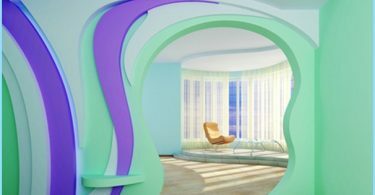 Having considered all the options and comparing them with the design of your own apartment, you can choose exactly what is right for a particular design style.